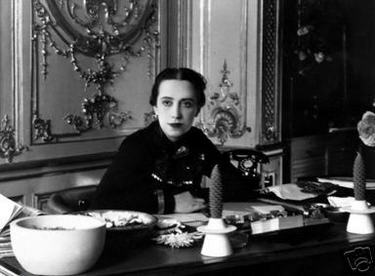 Elsa Schiaparelli (1890-1973) was one of the most influential designers of the 20th century. She had a way of making every woman want her radical, shocking handbags, hats, and clothing. She once said of her own designs, "It's only tinsel, trash, hardware, street fair showing off!". Well, it was gorgeous trash! 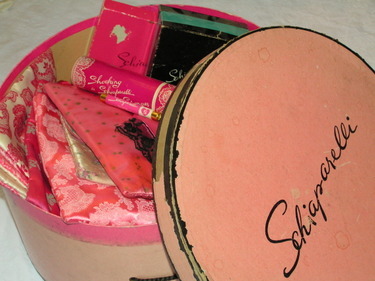 In the 1950's Schiaparelli became a houseshold name when department stores began selling her licensed products. Unlike her couture designs, almost everyone could afford her silky lingerie and hosiery bags. 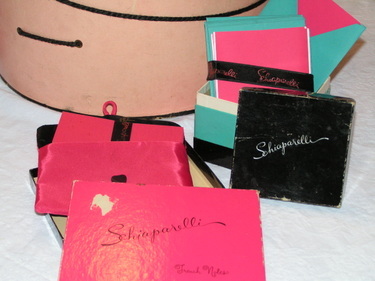 There was Schiaparelli stationery, playing cards, costume jewelry, jewelry pouches, perfume, and much more. You can readily find these items on ebay and in antique shops and flea markets. Pink and aqua blue have always been a favorite color combination for me. I love that she was using these colors decades ago, and now they're so popular again. Everything in fashion is a cycle. Any other Schiaparelli lovers out there? Oooooo! I adore this post! 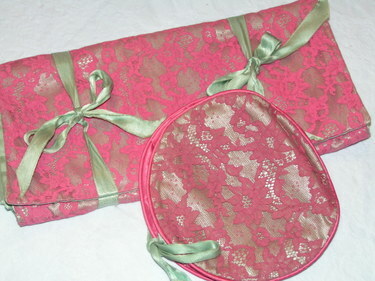 I have a lingerie bag that I bought 15 years (!) ago and have never found anything else Schiaparelli. I love your collection. You've given me yet another inspiration - thanks! 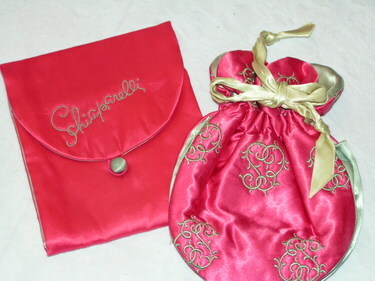 Wow, just the other day I was at a thrift store and I bought 2 lingerie bags by Schiaparelli. I didn't know what I was buying, I just liked the color and pattern! I love Schiaparelli and the combination of pink and aqua! Love this story, and your collection. 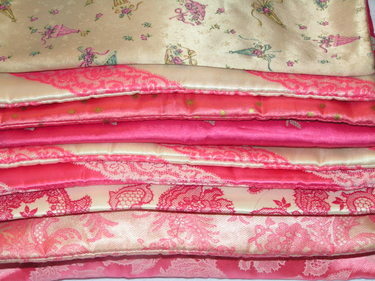 I love those colours, pink and aqua is two favorite of mine. I will have to keep my eyes open for these treasures. I forgot to ask. What part of Denmark did you visit? I'm glad you enjoyed it. I try to go back twice a year, since my whole family live there, and I "keep" my parents only two grandchildren over here : ( but then again, they do enjoy all the trips they get to take over here too. Your little boy is so handsome. Lille boys are very special, I have one my self. I am so jealous of your collection. All this pink gets me fired up!!! :-) Thanks for sharing!!!! Ooooh! Seeing these makes me a fan now! I love the pink. I had never heard of her, but certainly lovely things! I am very intrigued! YESSSSSSSS !!! oh dear, you just can't imagine what I am feeling at the moment. I have read her biography when I was at the fashion college. I have always thought she deserved to be as well known as Coco Chanel. And I have always admired her perseverance, she started her own business while growing up her little daughter alone, ...if I remember well, but what I am sure about is that I admired her. I never even thought we could buy items on ebay. I also just bought two of these bags and did not know until now what they were!!!! Yay-so glad I found this post!! Thank you! This post was written over three years ago, but I just had to find your blog post ever since I saw the photo in the Schiaparelli pool on flickr. This is an amazing and adorable collection! I have such infinite admiration and respect for Schiaparelli, she did some truly bold and innovative things. Which reminds me that I should make a blog post about my own meagre collection some time soon. I particularly love her hats. PS, I keep finding scarves stamped Schiaparelli on ebay/etsy, but they look like they are of pretty poor quality and made long after 1954. 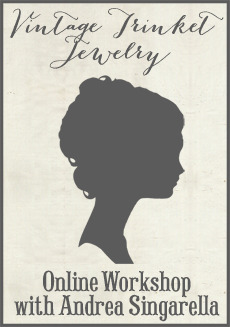 Do you think fake designer merchandise was as widespread then as it is now? Thank you for the information. I haven't heard about her but will sure keep my eyes open for some" treasures" from her. I love the colors she use and like you said, can't believe hot pink was in back at the day....Everything in design is always a cycle, that is for sure! !